William David sets out to follow the sun. He might have missed the moment of totality, but the ship did not disappoint. The chance to view a total eclipse of the sun does not happen very often. Nor does an opportunity to travel on the world’s oldest cruise ship. So when both came along at the same time, I couldn’t resist! 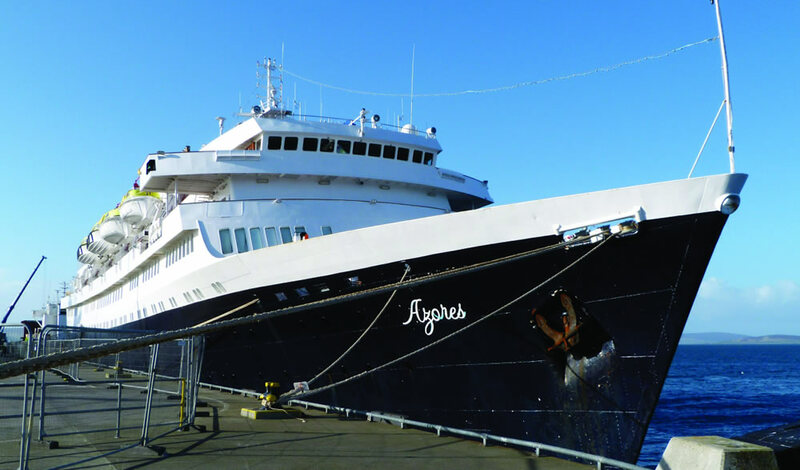 Now operated by Cruise & Maritime Voyages, the MV Azores began life back in 1948. Originally the Stockholm, she was later sold to the East German government, renamed the Völkerfreundschaft (‘Peoples’ Friendship’) and spent several years providing cruises to communist countries. On one such voyage to Havana she almost became embroiled in the Cuban Missile Crisis. At the last moment President Kennedy, suspecting her of carrying arms to Castro, decided the risk of torpedoing her rudder was too high, and she sailed on, unharmed. Little, if anything, remains above the waterline of the original ship. She may not be in the same luxury class as the latest ocean-going leviathans, but neither is she a stark Cold War relic: the public areas including the Sirenes bar, Lotus Buffet and Olissipo Restaurant are all well presented and comfortable with modern fittings. None felt intimidatingly large, which is not surprising on a ship with only 550 passengers – in fact you’ll probably be on nodding terms with most of your shipmates within a week! Entertainment is provided in the main Calypso Show Lounge (large enough to accommodate around 250 passengers). Despite happy hour offers, the separate nightclub and disco bar remained quiet until bursting into life just before midnight as the younger passengers (and crew) arrived. Billed as the Solar Eclipse and Northern Lights cruise, our itinerary began in Avonmouth and included Dublin, Iceland, the ‘big event’ at sea on the 20 March, followed by visits to the Faroes, Shetland, Orkney and finally Lewis in the Outer Hebrides. The atmosphere on board was very friendly: every crew member appears genuinely to love their job – an important quality. The cabins were comfortable if not over-generous; ours had large windows, ample wardrobe storage and the usual en-suite facilities, but we found quite a variation between cabins of the same size and quality rating. You can read the remainder of William David’s article in the June/July 2015 edition of World of Cruising magazine. If you are are not yet a subscriber then you can subscribe here today.